How to hide files on your Android smartphone??????????? Do you have images / photos / videos on your phone that you don’t want others to see? 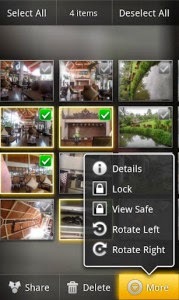 Stealth Mode added as a extra add-on which completely hides all the safe options in the application so someone who launches the application will have no idea what it’s real purpose is! They will go into the main gallery and not see any safe options, so they think its just a regular gallery! After 1 minute of inactivity e.g the application going into the background the stealth mode will reactived.